Constructing the impressive façade of the “Eisenzahn 1” property took more than two months. 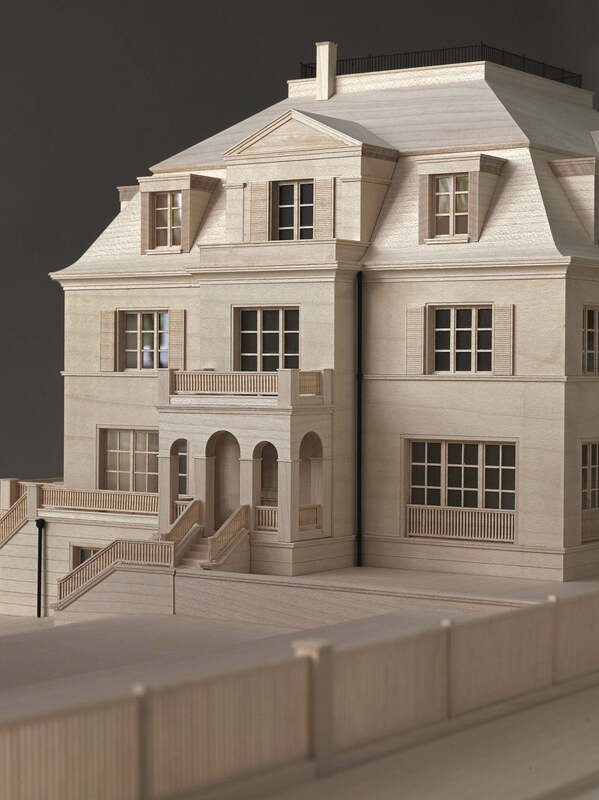 The supporting structure was made of MDF; maple wood was then applied as a veneer for the flat areas and in solid wood for the cornices and bay windows, whose perfectly rendered lines and curves showcase the remarkable artistic skill of the model makers. The city villa model for the Dahlem Duo corner property was created by Monath + Menzel on a 1:50 scale from light maple wood. Here the separate entrance to the mezzanine floor of the triplex apartment is shown, while over it is the master bath balcony. The exclusive city villas of RALF SCHMITZ are often preceded in existence by stylishly classic architectural models. These high-quality unique pieces are created by one of the best architectural model makers in Berlin, Monath + Menzel. Let us take you on a tour. The scent of vanilla and resin, aromatic and leathery, hangs in the air. Here, at the heart of wood model constructions, is the storage area for maple, beautifully light and nearly grainless, and pear wood, a little darker and evenly grained. In addition there are more rarely used types of wood, like reddish cherry wood, dark teak or the “Schöne Else”, service tree wood. Oak isn’t used because its grain is too strong and would distract from the model. Additionally, oak is too dense to be able to use practically in model construction. Most of the architectural models that are made at Monath + Menzel for RALF SCHMITZ are made from maple wood. Like the elegant Dahlem Duo, which required more than three months to complete, not just because of the complexity involved in the 3D landscape shaping. The façade of the lavish Eisenzahn 1 apartment complex on Berlin’s Kurfürstendamm is made up of a thousand unique pieces, including the railings, the garden fence and the splendid entryway made of blackened bronze. For the darker brick façade of Haus Weyhe in the genteel Berlin neighborhood of Dahlem, cherry wood was used for intricate details like the stucco cornices, columns and shutters, while maple was used for the roof. Since the early Renaissance, builders and architects have depended on miniature model construction. Today, it is usually a highly modern endeavor which is refined by staying “in constant contact with the architects via screenshots, data transfers and Skype calls.” But some key aspects of model construction are unchanged from centuries ago: ultimately the various elements of the models must still be painstakingly put together by hand to create a unique finished product. The results are “simply amazing,” says architect Sebastian Treese, who works frequently with RALF SCHMITZ. The house in miniature and its artistically created model give wings to our fantasy. This is what our future home should look like – beautiful!